The 28 projects include redevelopment of the capital’s main shopping area between Makarios Avenue, Evagorou and Stasikratous Streets, landscaping the old GSP stadium, and upgrading various other road networks. The president said a competition will also be announced for the new museum that will be constructed at the site of the old Nicosia general hospital. The announcement was made during a meeting at the presidential palace with the mayors of Nicosia municipalities, MPs and other town officials. Work is expected to start this year or early in 2016 at the latest. “I know the problems faced by the municipalities and the communities… I want to emphasise that our effort is to solve as many problems as possible and announce as many projects as possible,” Anastasiades said. He added that it would be impossible to satisfy all the local authorities’ demands under the current economic conditions. The projects include €28.8m for Makarios-Evagorou-Stasikratous, €5.9m for Makarios-Kallipoleos, €5.9m for bicycle routes, €9m for the refurbishment of the old municipal theatre, €10m for the reconstruction of Omirou Avenue and the creation of an underground parking lot, and €9.4m for the restoration of the Pancyprian Gymnasium. Some €8m have been earmarked to upgrade Tseri Avenue and an additional €15.8m for Aglandjia Avenue. A decision has been taken, the president said, to announce a competition inside 2016 for the construction of a new archaeological museum worth €50m. “We are going ahead with a project that the state has owed to our country for years. It is a work of honour to our country’s 8,000 years of history,” he said. The government has also decided to resolve the water supply problem faced by Nicosia by transferring water from the desalination unit at Vassilikos, Anastasiades said. 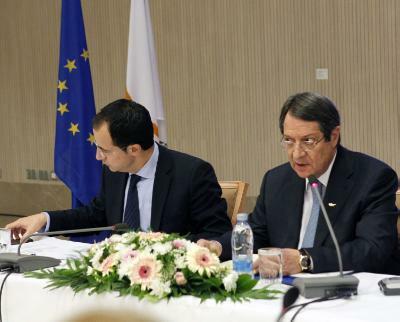 He added that despite the difficulties, the current government has completed €47.5m of projects in Nicosia. More projects worth some €102m were currently underway, he said.